Hey, did you hear the one about how the foreign market now accounts for 75 percent of the take on big studio releases? How ’bout the one where China, Japan, and the U.K. are the biggest box-office markets after the U.S., with Germany coming in at number 7, Russia at number 9, and Australia at number 10? Even if you haven’t, it’s a safe bet that director Guillermo Del Toro has. And, so, he’s bringing us the blockbuster action flick Pacific Rim: modeled after Japanese anime, set in Hong Kong, featuring Chinese, Russian, and Australian heroes operating giant robots named with the German word for hunter, and offering a Brit (Idris Elba) as its emotional core. Welcome to the new normal. Given the reach for an international market, anime was a smart choice for a storytelling template. There’s an entire movie packed into Pacific Rim’s prologue, but it threatens to become a dark satire, heavy on politics and social commentary. Short version: giant monsters called Kaiju start slipping through an undersea portal between dimensions and attacking coastal cities. Once the global scale of the threat becomes apparent, the world rallies together to create an army of giant robots (Jaegers) to battle the Kaiju. And, hey, the robots win! These devastating creatures become pop-culture punchlines and black-market commodities, while the Jaeger pilots become international celebrities. The movie’s tagline, “To fight monsters, we created monsters,” starts to take on unpleasant overtones. But before anything can get too heavy, the story shifts from world-political to personal-emotional. The Kaiju start winning. The Jaeger program falls from grace. Our hero Raleigh (Charlie Hunnam) loses his brother and fighting partner, the guy he mind-melded with in order to pilot the Jaeger. (A single mind tends to get overloaded.) Suddenly, we’re down to the last few Jaegers and their pilots, preparing a last-ditch effort to stop the Kaiju and working through their various issues. Cue the feverish emotion, baleful glares, dramatic battle poses, and on-the-nose dialogue so often seen in anime. Politics are divisive and satire is corrosive, but we can all get behind a little girl who lost her family, a rivalry between handsome hotshots, and a motormouth scientist with a crazy theory. So, yeah, the film’s heart is a bit mushy and melodramatic. But it’s protected by a steely exterior, one made of big punching robots. Del Toro does wonders with his CGI, even as he gives shout-outs to old-school technology (formulas on chalkboards, physical photographs, analog operating systems, etc. etc.). The scale of the Jaegers is breathtaking, and the fight scenes are just varied enough to keep from growing repetitive. The Kaiju are almost always partially obscured — by water, by buildings, by explosions, you name it — and so their mystery and menace are largely preserved. 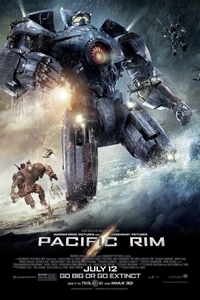 But however thrilling the visuals, Del Toro’s greatest achievement with Pacific Rim is its sense of fun. What could have played like a cynical cash-grab instead feels like a bit of goodwill-ambassador work, an offering from a movie-loving director to the movie-loving world.